At the center of the painting is a green and red yin-yang symbol. The yin-yang symbol is an expression of the universe’s constant state of change. Within an endless circle, the green is always encroaching on the red and the red is always encroaching on the green. In addition, the red and green each have a dot of the opposite color within their area, showing that nothing is pure. The green contains some red and the red contains some green. In this painting, the red symbolizes man and the green symbolizes the earth. As man creates his edifices, the earth immediately begins to erode them. In time, all manmade things will disintegrate. The yin-yang symbol is most closely associated with the Taoist religionist whose sacred text is the "Tao te Ching", written by Lao Tzu 2,500 years ago. My use of the yin-yang is not to promote Taoism. I used the yin-yang because there is no other symbol that embodies the one universal constant: change. Gods come and go, people come and go, things come and go, planets and stars come and go. All things that manifest from the Infinite Potential eventually disintegrate back into its oneness. From the yin-yang, a spiral expands clockwise around the painting. Along the spiral are alternating spheres of red, yellow and blue, the primary colors from which all colors can be mixed. The spiral is an ancient symbol that relates to the evolving universe. It also represents the coiled up snake, which is a symbol of wisdom and eternity. The snake is closely related to the dominant figure in the painting, the dragon. The dragon has many meanings but has always seemed to be related to uncontrolled chaos. The dragon is something to be conquered. The dragon is the ultimate primal nature that is all-powerful and destructive. By conquering the dragon within ourselves, we become enlightened. 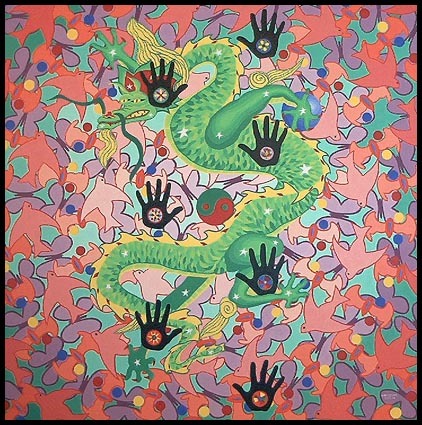 In this painting, the dragon represents the religions of the East. Taoism, Hinduism and Buddhism each focus more on the Infinite aspect of God than on the anthropomorphic aspect of the God of the Jews, Muslims and Christians. The Western view contains but a finite aspect of the all-encompassing essence of the one God. The black hands represent the religions of the West that are trying to control the dragon. On each black hand are generic mandalas, which are representative of the dominant religions of the West, including the Mormons and the Bahai's. Circling counter clockwise in the painting, along the lines of the spiral, are bats. In the East, the bat is a symbol of happiness and long life. In the West it symbolizes negativity, somewhat similar to the dragon, but also the sexual ambiguity of a hermaphrodite. Within the bat the forces of the yin-yang combine. All winged beings symbolize spirituality. Birds represent the higher consciousness of humanity. In many traditions, they represent human souls. In the painting, the birds emanate from the center and fly in an infinitely expanding spiral gaining more and more knowledge of the universe. This exemplifies the ever-seeking curiosity of humanity. Butterflies are also spiritual in nature. They evolve from caterpillars. Within their life, they experience a dramatic metamorphosis from crawler to flyer. In life, we are human beings, but in death we shed our bodies and fly as spirits. The butterflies, unlike the birds and bats, are not flying either in or out of the spiral. They are facing all directions which indicates that they are flowing freely and not on a particular path. The body of the dragon has many stars on it. This is symbolic of the dragon as a constellation in the night sky suggesting that the dragon is universal. The dragon has no wings; therefore it is of the earth. The black hands that hold down the dragon symbolize humanity, which is also earthbound. Swirling around the dragon are birds, bats and butterflies, which represent the transient spiritual beings and the guardian spirits and angels who dominate the non-physical world. The dragon's green hand on the blue sphere represents the earth. The dragon’s hand is symbolic of the continents that exist in the oceans. Therefore, the dragon is the earth. The theme of the painting is that all things change. Everything within the universe is chaotic because everything is in a constant state of change from one existence to another. In heaven and on earth, spiritual beings are constantly coming and going between the physical and non-physical dimensions. Control is an illusion. It only seems possible because of the limited time in which physical beings exist. Within the Infinite Potential, where there is no beginning or end, life manifests for finite periods. Human beings harness, tame and manipulate nature and live the illusion that they are in control. Yet in time, nothing survives as change constantly frees all things bound. All things that manifest disintegrate. As above, so below.